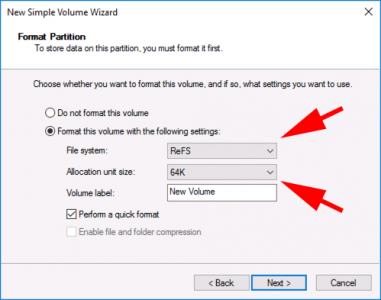 The file system on the specified volume does not support fast cloning. We recommend using ReFS volume formatted with 64 KB cluster size. Proceed anyway? The specified ReFS volume is formatted with 4 KB cluster size. We recommend formatting the volume with 64 KB cluster size. Proceed anyway? But there’s already data on the drive! Well tough, either accept and proceed, or move the data elsewhere and reformat. (At present there is no way to convert an NTFS volume to ReFS).